ASPARAGUS WAR – THE LONG AND THE SHORT OF IT! 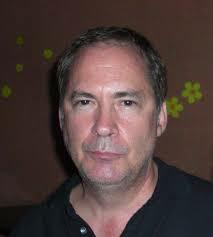 Plus Drew Noyes’ vehicle of self aggrandizement, the illegal Pattaya Times bombs, as 3 am ranting American tries to deflect attention from his fraud cases. The Times Higher Education, much better known by its former name the Times Educational Supplement has taken up the case of Wyn Ellis which has been given a lot of exposure on this site. The ‘THE’s’ latest story is even being blurbed by dogged correspondent in Singapore exile Andrew MacGregor Marshall. The latest story follows our lead here published two weeks ago. Of course at this site we follow things from beginning to end, but its always nice to see others take up the cudgels and follow our lead. And to put it in perspective we did after all only follow up on Erika Fry’s story – but that because the Bangkok Post’s former investigator fled rather than trust her defence to her bosses. 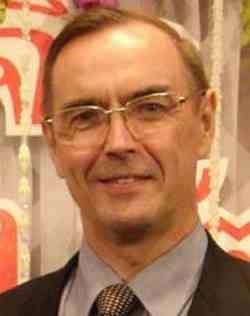 Wyn Ellis, from Swansea, is of course the scientist whose thesis on organic farming, in particularly with regards to asparagus. was stolen by Thailands Director of the National Innovation Agency, which of course quite innovative of itself. 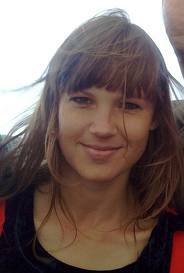 Since Wyn Ellis exposed his activities through Erika Fry he has been subject to a long campaign of harassment, which has included raids by officials on his home, and rocks being put through his car windows. Erika was scared the Bangkok Post to get themselves acquitted, were doing deals behind her back, ahem, which they were. Where has that happened before? (Thinks) Oh yes, the Bangkok Post. in Thailand – and have become the nemesis of the Pattaya-Times.com which invents stories about us. See the comparisons below. But there are no comparisons really. 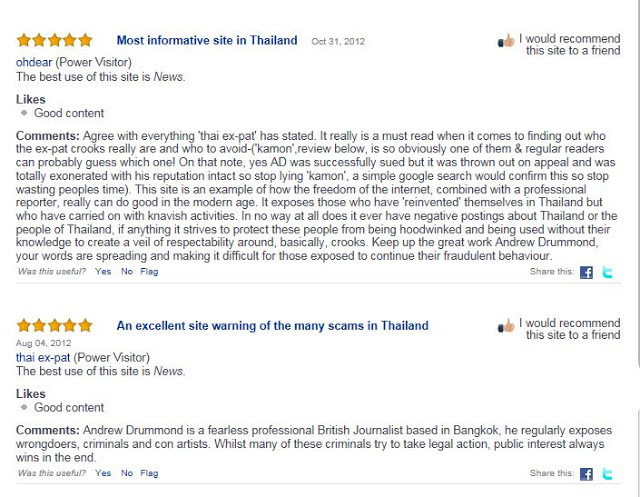 This is one of the top English language news sites in Thailand and certainly the top investigations site. 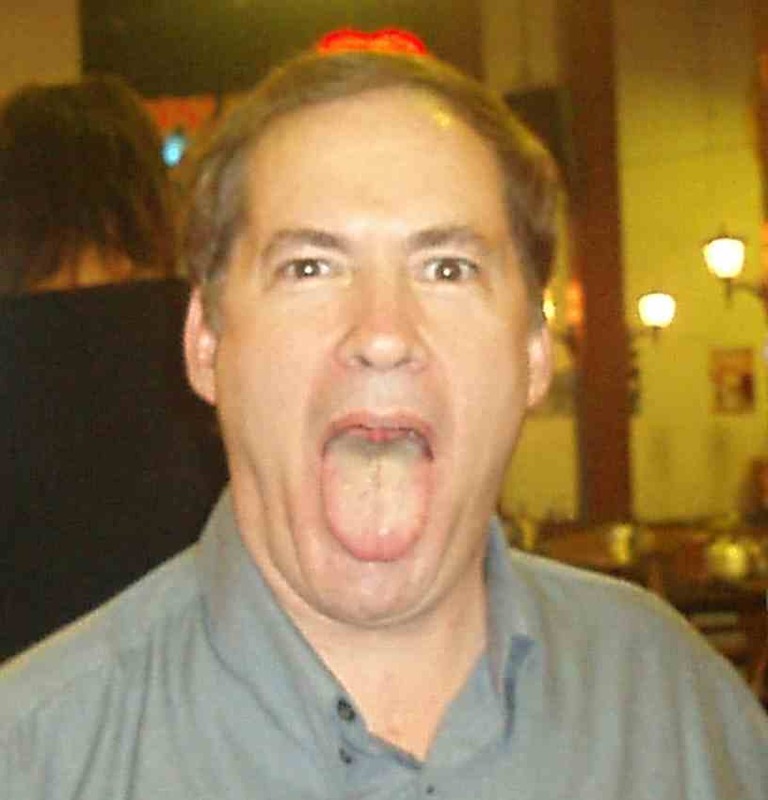 For this we have to thank Drew Noyes himself, an American in Pattaya whom we have been exposing for his frauds, and who has been fighting back putting all sort of drivel on the net, on the Pattaya Times and on his One Stop Services Center website in Pattaya. He has given us endless fodder. Warning keep clear of this One Stop Service Center by the way. 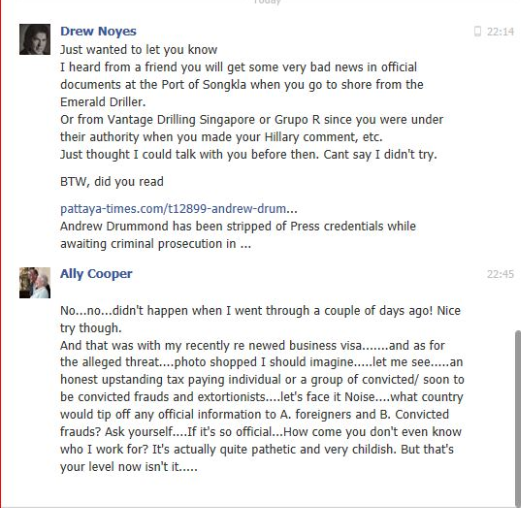 Pattaya Times founder Drew Noyes seems to blames all his ills on us and on the Pattaya Times website (There have been no news stories since April) he now claims, I am a Nazi, my credentials as a journalist have been withdrawn in Thailand, that I print false stories about ‘respectable businessmen’ to ‘conger up’ (sic) clients, together with a middle aged woman and elderly lawyer, that I am being investigated by the CSD and DSI (zzzzz where have we heard all this before, oh the Pattaya Times owned by Drew Noyes and allegedly edited by Wanrapa Boonsu) and whoops I am being chased by Immigration Police too! 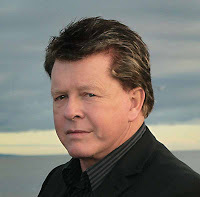 He also claims that I am being sued by ‘Babyface’ David Hanks* ‘an honest businessmen’ and Anglo Saxon (sic) and former owner of the Masquerades Brothel in Melbourne. Anglo Saxon? He’s a Celt! Oh and that I have given Hanks elderly young sister a stroke by ordering a reporter to bang on her door in Girvan, Scotland! Also that I have to report to Immigration every 60 days! I am also going to jail according to Noyes for periods of five to 50 years and have something between 8 and 76 charges against me, er, somewhere. He reports I have had no articles printed in the Evening Standard, the paper to which I am accredited, that I am the recipient of an anti-racism award that does not exist, and that after joining the Nazis I fled and relocated to Cambodia. Wow! The Odessa File of South East Asia. Pass the valium Drew. * This one is true. David Hanks is suing me for calling him a maeng da. I did not. I called him a former pimp. There is no other word in the English language to describe his former occupation. The case is going nowhere. A reporter did call on her sister in Scotland. She said she knew he ran a brothel in Melbourne. ‘But I didnae approve’. If she had a stoke it as probably because her brother Baby Face was splashed all over the Scottish Sun. Good heavens, with all this juicy stuff in the Pattaya Times his circulation should be soaring. But alas the paper is no more and the website is dedicated to us. And below is just how the Pattaya Times Online is fairing in comparison – and then some Drew Noyes rants! The bounce rate is based on what percentage of people click on to the site, look at just one item, and click off. 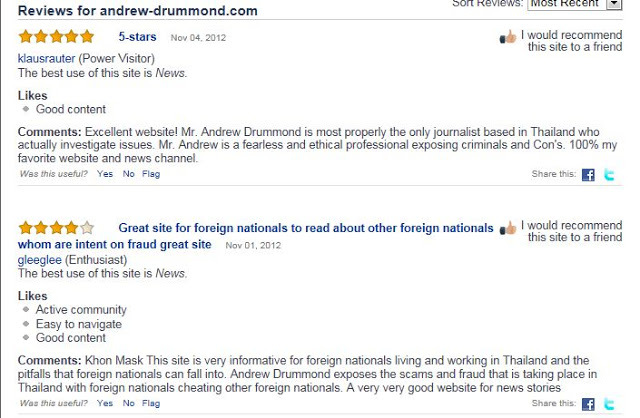 The comparison between Andrew Drummond.com and Pattaya-Times.com is staggering. We’ll there’s no comparison. AND THE REVIEWS ARE NOT THAT BAD EITHER! So here are Drew Noyes’s latest rants as he shoots himself in the foot once again. 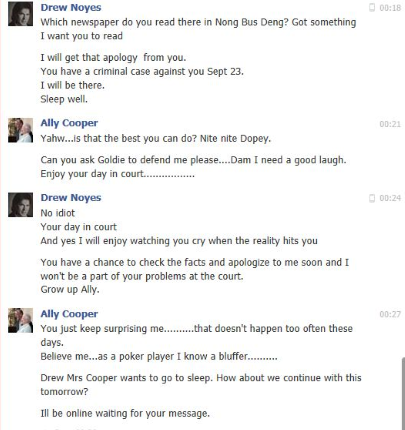 They are to Ally Cooper, a follower of this site, who works offshore, and obviously likes winding up the ‘the most credible, re-assuring American’ to have graced Thailand’ in the early hours of the morning, when Noyes is at his computer furiously pounding away. Seems like he is now commanding the Royal Thai Navy! Notice he uses a 30-year old photograph. time lying about people. Do you want to be friend or foe? Pick tonight. Call me after 11 am tomorrow if you want to talk. you posted up verified. They said it might take a week or so. in Bangkok soon. So will his team. Are you willing to go down with him? Anon: I would think you would welcome independent confirmation. Drew: Sleep well tonight. It may be the last night you sleep at home. If you call before noon I can help you . The letter in Thai has now been taken down from the net. Could Drew and Wanrapa be guilty of forgery, particularly as the PRD, who have known me for 20+ years, rang me up today to tell my credentials were quite valid and I had not even asked them yet. I thought you were banned from working as a journalist? Aparently not! The traffic rankings for pattaya-times.com are actually much worse than those of pattayamail.com listed above. Global: 374,886 Thailand: 7,553. Yes Andrew……I had a lengthy and interesting messaging session with the man of fake everything last night, he again claimed you'd had your press card revoked….I've sent you the screen shots. Man that’s one messed up puppy! You have my permission to use the screen shots if you wish. I've never encountered somebody so delusional, it was quite a disturbing episode, we finished the session with him threatening to bash my fat something….yep as if that’s going to happen……I’m inclined to believe he needs help! Asparagus tips !!! Anyone ?? Thaipublica (Thai only) is also following the Dr. Ellis story. This website cites many, many cases of corruption and other strange goings on in the LoS. Continued good luck with what you do, Andrew. I got a similar rant from Drew via SMS. When I told him I had called the press credential people and they told me AD's press card was still valid until November 19, it gave me a chuckle. I'm honestly worried about Drew. He's deluding himself if he thinks anyone believes a single word that passes his lips or comes from his fingers. May I suggest adding the link in John's comment to your article so the link will function. It will help both your site and Thaipublica's. Noyes is unbelievable!! Does he not realize that 99.9% of people actually have intelligence? He may prey on the 0.01% but he just continues to make himself out to be a complete and utter lunatic! Noyes, you can learn a lot from Colov.. stay cool man! Colov still has a business unlike you! Noyes and Goldie are just different gravy. Noyes seems to be on another planet, if he was back in beer bars they'd be a winner just for pure entertainment value. Regarding Goldie – I thought the British Forces had their own way of dealing with Walter Mitty characters?